Aah, so my friends who read this blog probably know about my baking complex. I had written an earlier post expressing my confidence levels when it came to baking and how I wanted to change that. So, I pulled myself together and dove in. Dove into a sunny world of warm milk, flour, sugar, butter, cream, vanilla and cinnamon. I have to admit- the smell of vanilla and sugar warming up your kitchen is pretty darn good. And when I finally pulled my creation out of the oven, it came out ok!! (Alright, it’s actually a convection microwave, but I didn’t want to kill the mood.) I felt such glee. Like a little kid who got his favourite toy in a box of Crackerjack. I first read about clafoutis on Hillary Davis’ blog, Marche Dimanche, where she shares a lot of great French recipes and anecdotes about French food. I know what I’m about to say next is a mouse-click away from a hundred other baking and cooking blogs, but I’m still going to put it in here. Clafoutis is a French country dessert that is traditionally made with cherries- it was made to celebrate the first cherries of the season. 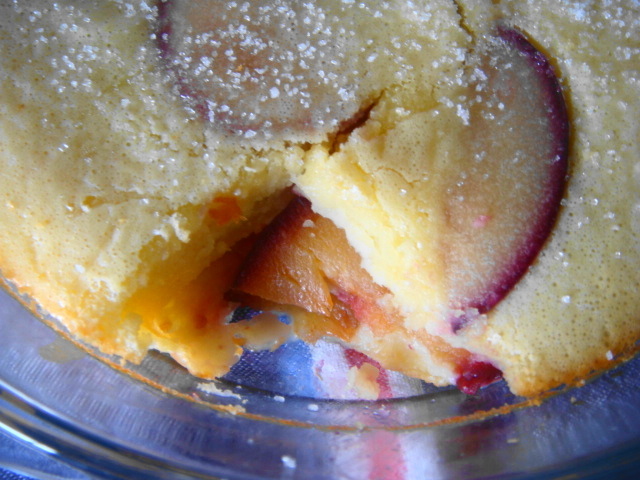 Today clafoutis has evolved into a sweet baked dish that can be made with all kinds of fresh fruit and is eaten as breakfast, brunch as well as dessert. I could eat it anytime! What drew me to the dish was it’s simplicity- whisk together flour, sugar, eggs, milk, cream, butter and vanilla and add some fruit. Most of the recipes I came across online used berries like cherries, blueberries and raspberries but I used plums because that was what I had on hand. 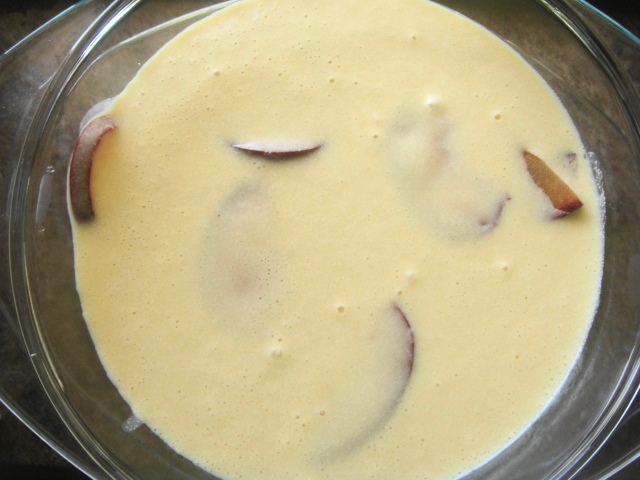 As Hillary describes in her blogpost, the consistency of clafoutis is more cake-like than custardy, but if served warm, it can feel like a custard. Mine came out more cake-like, but was good all the same. I love the flavour of cinnamon with sharp fruit, so I decided to poach the plum slices with some cinnamon. The recipe already had vanilla, and I figured, why not canelle when there’s vanille? Whatever pleases your palate! In a saucepan, heat the water and bring it to a gentle simmer. Add a stick of cinnamon, swirl it around to release the flavour. Add the sliced plums and let them soften a bit. Turn off heat, drain the water from the plum slices and keep aside. Butter a 6 inch baking dish and sprinkle some granulated sugar on the bottom. 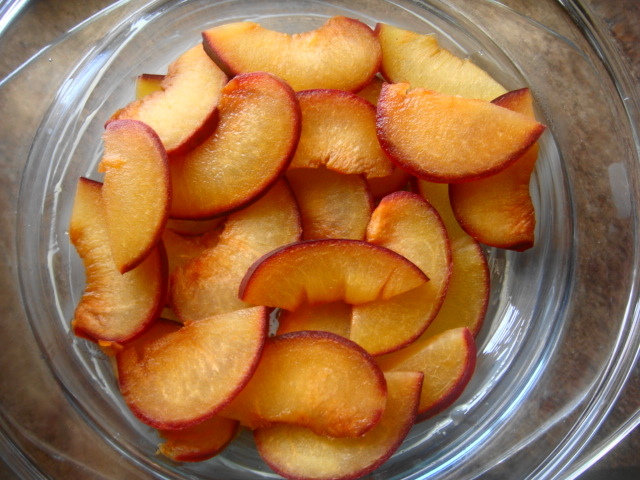 Place the cinnamon-infused plum slices on the bottom of the dish. In a large mixing bowl, beat the eggs. Then beat in the milk, cream, flour, butter, sugar and vanilla extract. Beat on medium speed for 3-4 minutes. 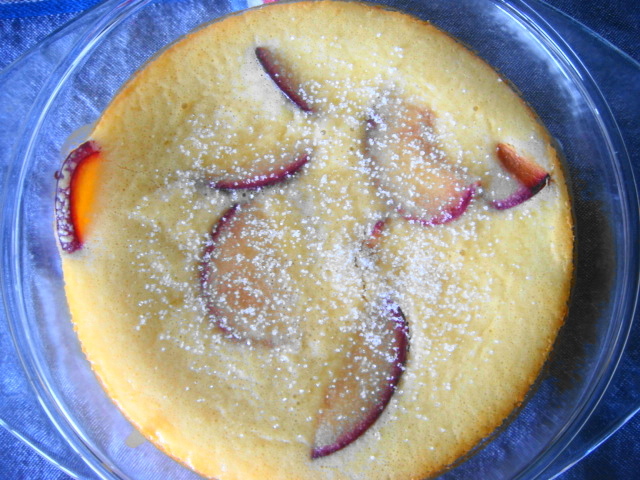 Pour this batter over the plum slices in the baking dish and place in the oven. Bake for 20-25 minutes, till it gets puffy and golden brown around the edges. My clafoutis came out more cakey, and could have done with a more golden top, but for a first attempt, it was not bad. No eggy aftertaste! The plums were tart, giving an apple-like floral flavour; which was offset nicely by the cinnamon and vanilla. I think I’m going to bake more from now! My consistency was more custard like and I wondered if I didn’t cook it long enough. It came out gorgeous, puffy and tall and browned. It did fall, like a cheesecake does as it cools. It tasted okay, but I thought it was supposed to be more cakey also. Guess it doesn’t matter as long as it tastes good, right? Hey Joyce! Sorry for the late reply. Well that’s what’s great about a clafoutis, it can be cakey and custard-like at the same time! Mine usually ends up cakier at the edges with a more oozy middle. And yes- I am also in the camp that if it tastes good in the end, it doesn’t matter!! Prianca I’m telling you, you will be able to. I wish I had a Cinnabon near my house here!! Thanks for visiting Renu chechi! 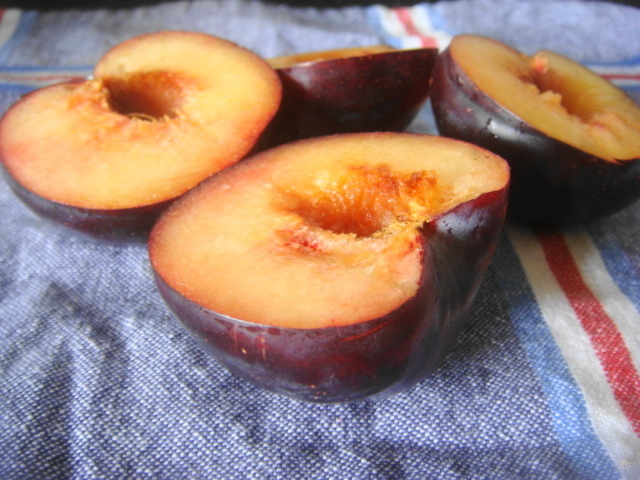 I am just starting out…I saw your plum cake prep, I’m sure it will turn out really well! great pics! i should try the recipe sometime.. i haven’t tried anything sweet and/or fruity so far..
it’s a 39-second video on street food on the way to college, here in Shanghai.. Thanks Kurush! Have been following your blog since the Bungalow 9 post and I enjoy your anecdotes and travel stories. Now that I have overcome my fear, I shall bake more! Dude! You did it…. take a bow take a bow… Love the pictures…I’m going to try this out….with apples. What fruits do u reckon wont taste good in a clafoutis or will anything work? Thank you Namuuu! Apples will be great, and I guess any fruit except perhaps watermelon?! I’ve come across recipes with cherries, peaches, raspberries, kiwis, even prunes! Mouth watering! Im not even going to attempt it tho… its too advanced for my culinary skills (or the lack thereof) 😦 oh but cinnamon and vanilaaaaaa…OK im going over to the nearest bakery right the hell now.